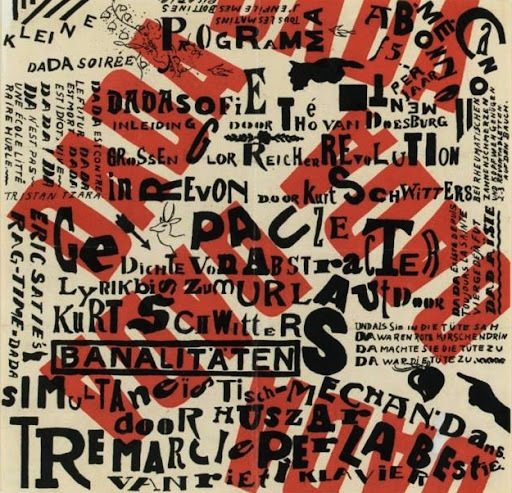 Published by Theo Van Doesburg and Kurt Schwitters as a poster and program for Kleine Dada Soiree (Small Dada Evening), 1922/1923. This lithograph serves to represent Dadaism, an art movement which responded to the catastrophe of World War I by rejecting reason, harmony and beauty in favor of irrationality, chance and offense to good tast Schwitters and the Dutch artist Theo van Doesburg embarked on a tour of Holland to introduce Dada to local artists and the public through lectures and performances. Van Doesburg’s pamphlet 'Wat is Dada?' was for sale at the close of each stop. The poster for the 'Small Dada Evening' includes the event program, which lists ragtime music by the composer Erik Satie, abstract poetry by Schwitters, and 'Dadasofie' by Doesburg. The poster is decorated with multi-lingual slogans including: 'Dada est contre le futur, Dada est mort, Dada est idiot, vive Dada! Dada is against the future, Dada is dead, Dada is idiotic, Long live Dada! '.